Evidently, this is the gateway to H-E-Double Hockey Sticks. As you probably know, adult coloring books are a thing these days. Not for me, though. I hate coloring. In fact, I have always hated coloring. Why? Mostly because my ADHD makes staying inside the lines a real challenge. Now, you might be thinking, “So what? Color outside the lines. Nobody cares.” Unfortunately, I’m also have a slight case of OCD (part of the wonderful package deal that comes with ADHD), which means coloring outside the lines drives me absolutely crazy. But, it turns out that coloring isn’t just irritating, it’s also spiritually dangerous. A couple of days ago, l stumbled across Melanie Tubbs’ article “A Southern Pastor: The Evils Of Adult Coloring Books” on Liberal America. Ms. Tubbs, a UMC pastor, writes about the penchant of some conservative Christians to ascribe any pop culture phenomenon they don’t like/understand to Satan, bringing up things like Disney’s “Pocahontas” (worshiping nature) and Harry Potter (witchcraft!). Finally, she got around to the main event and linked to a blog called The Last Hiker and a post titled, “Adult Coloring Books and Mandalas, A Warning For Christians“. And, that’s where I found out these coloring books are how the Devil gets in. I don’t know the Hiker’s name as it’s not listed anywhere on his site, so I’ll just refer to him as LH. Now, according to LH, The problem is not so much the act of coloring, as it is what you’re coloring. And, if you’re coloring mandalas, which most of these adult coloring books are filled with, well…, you’re probably going to hell. And, not alone either. You’ll be taking the trip with a full complement of demons leading you by the hand. A mandala, as LH so helpfully points out, is a “beautiful circle pattern that looks like it would be impossible to draw free hand”. Mandalas are also “spiritual and ritual symbol in Indian religions, representing the universe. In common use, mandala has become a generic term for any diagram, chart or geometric pattern that represents the cosmos metaphysically or symbolically; a microcosm of the universe.” Nice, huh? Well, not so much, because LH also informs us that tantric Buddhists also use them as aids in meditation. In his words, “They believe that you can merge with the deity by meditating on the mandala. ‘A mandala is also visualized (dhyana) by the yogin whose aim it is to merge with the deity’….Focusing on mandalas is a spiritual practice where you merge with ‘deities’–this practice opens the door to demons.” I’m just guessing, but if LH gets this bent out of shape over a coloring book, he probably isn’t a big fan of yoga or contemplative prayer, either. Isn’t it funny how evangelicals and fundamentalists are so frightened by eastern religions like Buddhism or Hinduism since Christianity is, itself, an eastern religion? Oh sure, western Christianity bears about as much resemblance to faith practiced by those early followers of Jesus as the current American political system does to what was set up by the founding fathers 200 years ago, but that’s where it came from. People like LH just need to take a chill pill and relax. 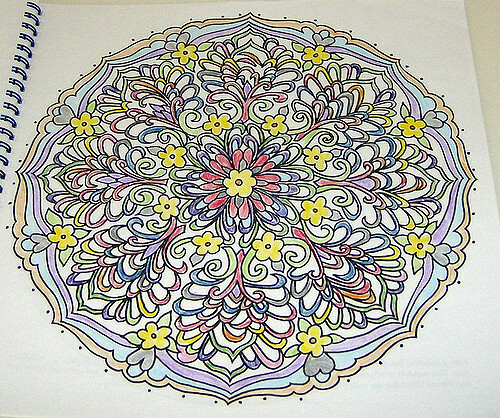 A good yoga session and coloring book should do the trick quite nicely.